This an article summary of a study by Dr. Susan Foutaine, Massey University and appears courtesy of the author. For her full study, please visit here. Social media has given politicians the ability to communicate with their audience directly, particularly during election campaigns. Internationally, politicians use of Twitter in electoral campaigns has increased steadily over the last 10 years. Politicians have been using Twitter to interact with voters and key opinion leaders. They mostly use it during campaigns to post information about campaign activities and links to websites. “the management process by which an organization or individual for political purposes, through purposeful communication and action, seeks to influence and to establish, build, and maintain beneficial relationships and reputations with its key publics to help support its mission and achieve its goals” (p. 8). 1. How do young women politicians frame themselves on Twitter during election campaigns? 2. In what ways are these frames consistent with political public relations and the strategic framing typology for political public relations advanced by Hallahan? These two questions are answered by looking at a specific election campaign in New Zealand (NZ), during 2014. This study looked at female politicians, Nikki Kaye and Jacinda Arden during their 2014 general election campaign, to explore how young women use Twitter to frame themselves during election campaigns. 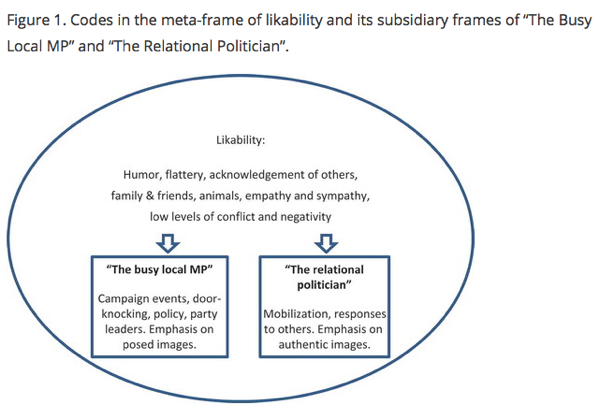 As you can see in the above diagram, a meta-frame of likability was identified in the women’s Twitter communications during their campaign characterized by the traits above. Within this meta-frame, the women also framed themselves in slightly different ways; one as busy and the other as relational politicians. This framing was secondary to the strong emphasis on likability. RQ1: How do young women politicians frame themselves on Twitter during election campaigns? Kaye and Arden posted combinations of content that showed some policy, creating the impression that their personalities were reliable and that they were approachable. Kaye regularly tweeted about her (and her party’s) official campaign events and policy announcements, but she also showed her soft side by tweeting humor, sympathy, flattery and animal stories. Whereas, Arden’s tweets were much more policy-light, sending out more personal tweets that were affectionate, flattering or humorous. Kaye and Arden’s likability were also conveyed in tweets acknowledging the contributions and support of their campaign workers. Their tweets suggest they had long term relationships with their party networks. Finally, the relative absence of conflict and negativity in their tweets was the final underpinning of their likability framing. Both Kaye and Arden sent just one negative message, but the negative part was not the main focus of their message. Being that the seat they were campaigning for was so closely fought, it’s surprising that the two women did not try to attack one another on Twitter, since those types of tweets are usually more common in competitive races. Kaye’s Twitter portrayed herself as busy and committed to serving her community through self-promoting tweets. She often quantified her busyness and posted photos after work, not inviting attendance to her events. All photos that Kaye sent of herself were posed, featuring campaign workers. All of the photos she posted of apparent voters were of young well-dressed men. Arden’s Twitter relayed authenticity and promoted voter mobilization. The images she posted were less posed, showing her interacting with groups of voters at various day-to-day locations. Her pictured voters were diverse, including students, older voters and women as opposed to Kaye’s images of young male professionals. Arden’s mobilization was apparent in her tweets and retweets as she would invite participation and attendance to her events. RQ2: In what ways are frames consistent with political public relations and with Hallahan’s typology? Let’s first acknowledge the different types Hallahan typology: framing of situations, framing of attributes, framing of risk, framing of arguments supporting actions, framing of issues, framing of responsibility and framing of stories. A political actors’ goal is to establish shared frames to build relationships and receive positive political outcomes. Within the meta-frame of likability, Kaye emphasized her commitment to Auckland Central by tweeting regularly about her traditional campaign tactic of door-knocking. This increased the impact of her reputation. By regularly praising her volunteers’ efforts throughout her campaign, Kaye had created a strong party-organizational culture. Her use of hashtags and political tweets kept her on-message. Arden’s Twitter content emphasized more attendance at events and primaries and less on informing her audience about her political stances. She did not utilize hashtags to their full potential. Although both candidates used Twitter differently, they both had their own strategic relationships. Overall, Kaye’s and Arden’s strategies aligned with traditional feminine strength, and sidestepped areas of possible weakness or risk, likely enabled by the female-versus-female nature of their race. For Dr. Susan Fountaine’s full study, please visit here. Amanda Carr is a sophomore at the University of Florida. She is majoring in public relations and is a member of the University of Florida chapter of PRSSA. Follow her on Twitter @amandaraecarr98.